Ugrunaaluk kuukpikensis in winter. Illustration for the newspaper Helsingin Sanomat. Back at the time, many people considered the Mesozoic world a constant tropical hothouse, with little variation on climate. Dinosaurs were portrayed as great lizards that required tropical climates to thrive. Arctic dinosaurs give one more killing blow to that already pretty old-fashioned concept. They lived in a cold climate well beyond the Arctic circle – and apparently thrived. But what was their world like? I recently wrote a newspaper article on the newly described Alaskan hadrosaur Ugrunaaluk kuukpikensis. For that, I read a bunch of papers about the flora and climate or Cretaceous Arctic. I also contacted paleoclimatologist Carla Tomsich from the University of Alaska, who turned out to be an incredibly helpful and nice person. Here’s what I learned about Ugrunaaluk‘s world. Ugrunaaluk was found from the Prince Creek Formation in the Alaskan North Slope. That is, it lived in the Maastrician epoch, about 69 million years ago. The area is now the northernmost plains of Alaska, sloping down into the Arctic Ocean. Ugrunaaluk coexisted with Troodon, Pachyrhinosaurus, the dwarf tyrannosaur Nanuqsaurus, and a variety of other dinosaurs. Back in the Maastrichian, the area would have been even further north than it is today. It’s is estimated at 80 to 85 °N, which means the latitude of Svalbard at minimum, and perhaps halfway towards the North Pole again. Extreme north does not necessarily mean extreme cold, though. Even though the Earth’s climate had been cooling for millions of years, Maastrichian was still a global hothouse compared to today’s world. The annual mean temperature of Prince Creek area was around + 2,5 to 5 °C, which corresponds to Southern Finland. The annual average of Helsinki, where I am at the moment of writing this, is + 4,8 °C. The Maastrichian Arctic, then, was a combination of high latitude and relatively warm temperatures completely unknown in today’s world. Polar night lasted from October to February each year, and was then countered by midnight sun during the summer. There might have not been that much literal midnight sunshine, however. Alexei Herman and Robert Spicer suggest there was a permanent polar cloud cap that only rarely if ever broke. This would prevent the tropics from overheating during such a warm climate. Combined with the proximity of the Arctic Ocean, this means the temperature range within a year was pretty small. Winters were mild and summers cool. Though the average temperature was just barely above zero, freezing weathers might not have been long or severe. Indeed, there are no signs of glaciation or boulders moved around by ice. Despite mildness, it was cold and cloudy enough that ectothermic reptiles are unknown from the area. There are no crocodilians, champsosaurs, snakes, lizards, or turtles known from North Slope. In today’s world, lizards and snakes live well north of the Arctic Circle, but they are absolutely dependent of direct sunlight to aquire body heat. If the permanent cloud cap really existed, it might have been the reason why even the most cold-hardy reptiles simply aren’t there. Under the cloud cap, it was a grey, wet and lush world. It was rainy – estimated at around 500 to 1500 mm per year. Coal deposits in the sediments tell a tale of ancient swamps. While productivity seems to have been high, plant diversity was low. That is, few plants tolerated these odd conditions, but those that did, grew vigorously. On a first glance, Maastrichian Northern Alaska might have pretty closely resembled modern taiga. Taiga are the conifer-dominated woodlands that cover much of the cool temperate landmasses. Specifically, it resembled the northern parts of the taiga. There were small and widely spaced trees and plenty of swamps. You can see this kind of vegetation in, for example, middle parts of modern Alaska, or in Finnish Lapland. 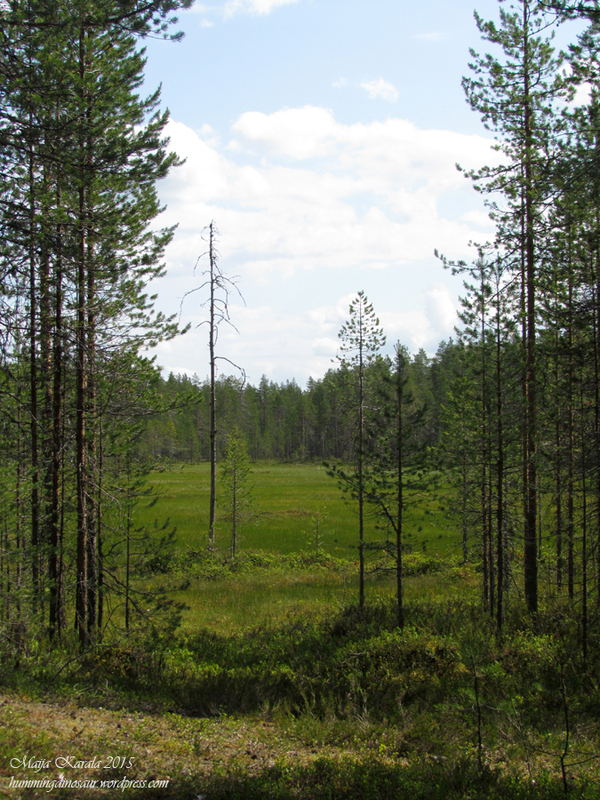 A possible model for North Slope: a swampy coniferous forest in Kuusamo, Northern Finland. The dominant tree was Parataxodium wigginsii, a deciduous conifer closely related to modern dawn redwood (Metasequoia). It wasn’t particularly large: the trunk girth of mature trees is estimated to be just 20 cm (or a bit less than eight inches). Most conifers in these latitudes probably shed their needles in the autumn, but there might have also been some juniper-like evergreen species. There were plenty of ferns and horsetails in the undergrowth. Some reconstructions of plants known from North Slope or similar areas in Northern Russia. Hollickia, top left, was probably a shrub, Quereuxia (=Trapago) angulata a floating plant, trochodendroid a vine. On the bottom row are Maastrichian arctic ferns and a horsetail Equisetum arcticum, known from Amaam Lagoon in Northeastern Russia – not too far away from North Slope. While angiosperms, or flowering plants, were already hugely diverse in more benign climates at the time (such as Hell Creek, the home of Tyrannosaurus rex), they apparently still weren’t quite ready to tackle the Arctic. There are exactly three types of flowering plant leaf fossils known from North Slope: probably one shrub, one aquatic floating plant, and one vine. However, the fossil pollen record tells a slightly different story. There are pollen types of at least three flowering plant families, one of which (called Aquilapollenites) occurs in a great diversity. It’s, however, unknown what kinds of plants exactly they come from. Carla Tomsich suggested they are probably from small, herbaceous weed-like plants that don’t shed their leaves but die off completely in the autumn, overwintering either as seeds or underground growths. These plants wilt so fast they rarely fossilize. The bog-star or grass of parnassus (Parnassia palustris) is one of the tiny, herbaceous flowering plants of modern Arctic. Apparently, Arctic dinosaurs walked through flowers during the spring and summer, though we don’t know what the flowers looked like. Many were probably insect-pollinated, though, which suggests they were pretty to attract the attention of their pollinators. Modern polar areas are rich with tiny, but beautiful flowering plants. Perhaps North Slope was similar. Herman, Spicer & Spicer (2015) give some fascinating bits of educated guesswork in their new paper. They suggest that when the sun finally came up after the long polar night, plants did not need to wait for temperatures to rise (it was fairly mild year-round), but started growing immediately. This would have placed spring bud break around late February to early March. Spring ferns. In the Cretaceous Arctic, speed was important. The faster after the spring’s first sunrise an undergrowth plant manages to sprout, the better. Before spring bud break, there is a short window for growth without a shadowing canopy overhead. However, the weather was unpredictable. Ground frosts, even snowfalls were possible into late March. Even throughout the summer, growth rings of fossil trees show signs of sudden cold periods when temperature dropped below + 10 or even below + 5 °C. This was probably not much of a problem for the cold-adapted plants, but might have given some additional challenge to nesting dinosaurs. North Slope was, then, both foreign and oddly familiar to someone living in the northern latitudes. It’s a testament to the incredible adaptability of dinosaurs – and an interesting artistic inspiration. Spicer & Herman 2010: The Late Cretaceous environment of the Arctic: A quantitative reassessment based on plant fossils. Palaeogeography, Palaeoclimatology, Palaeoecology. Herman, Spicer & Spicer 2015: Environmental constraints on terrestrial vertebrate behaviour and reproduction in the high Arctic of the Late Cretaceous. Palaeogeography, Palaeoclimatology, Palaeoecology. Personal communication with Carla Tomsich from the University of Alaska Fairbanks and Mikko Haaramo from the University of Helsinki. Great natural history article. Thanks for posting! Very informative! I need to read the other entries in this series, though I’ve a question about this one: I find it hard to resolve a ‘permanent, rarely-broken cloud cap’ with vigorous plant growth. Would enough sunlight get through in this scenario? Actually, it seems plants grow just fine under cloudy skies (thankfully, because otherwise we would be living in a pretty barren environment in Finland!). Full sunlight is a bit harsh for many plants: they need to grow a protective layer of wax or hair to prevent their leaves from burning. They would probably respond by growing thinner, softer leaves, but were otherwise unharmed by clouds. Maija Karala is a biologist and a freelance science writer from Finland. She has written for many Finnish magazines and newspapers, occasionally also illustrating her articles. There's some more information in the About me page. This blog is dedicated to the weird and wonderful living things this planet is swarming with, and has been for the last few billion years. If you're interested in, say, evolution, dinosaurs or science in general, welcome. As English is not my native language, I welcome all Grammar Nazis to do whatever Grammar Nazis do.